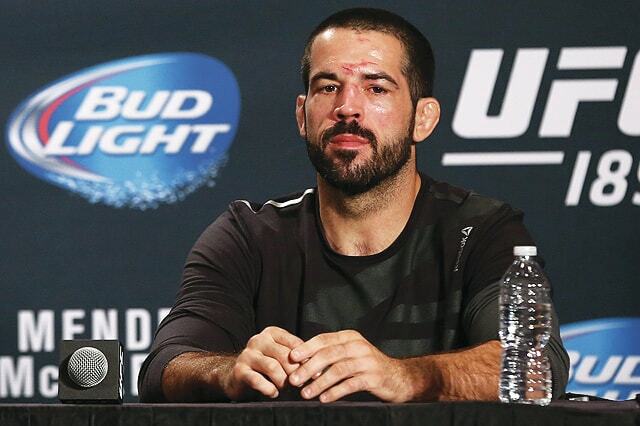 Xenia native Matt Brown meets with the press after his fight against Tim Means at UFC 189. Brown won the fight by submission at the 4:44 mark of the first round. 1. (tie) Anonymous Joes, Mr. P’s (4-1); 3. Red Wing Shoes (3-3); 4. The Funk/Liberty Tax Service (2-2); 5. (tie) Average Joes, Great Clips (2-3); (2-3); 7. The Funk/Bowl 10 (1-5). 1. (tie) The Funk/MPPR Lawncare/Jim’s Body Shop, Miller Collision (5-1); 3. (tie) Anonymous Joes, Relentless Cycle & Speed (3-3); 5. Beach Manufacturing (2-4); 6. The Funk/El Rancho Grande (0-6). 1. Maple Avenue Church of God “B” (6-0); 2. Heart-N-Soule (5-1); 3. Arrowbrook Baptist (5-3), 4. Medway United Methodist (4-3); 5. St. Mark’s Episcopal (3-4); 6. Huber Mennonite (3-5); 7. (tie) Spinning Road Baptist, St. Christopher’s (1-6). WILBERFORCE — Central State Athletic Director Jahan Culbreath has announced the department’s Hall of Fame committee’s 2015 inductees. Joining the CSU Hall of Fame this year will be Thelanious “Laney” Prioleau, Dr. Arthur E. Thomas, and the 1990 Central State football team. In addition to this year’s inductees, Central State’s undefeated 1965 men’s basketball team will be in attendance to celebrate their 50th anniversary. The ’65 team won the school’s first NAIA national basketball title with a flawless 30-0 record. The 2015 Hall of Fame Luncheon will be held at 1 p.m. on Friday, Oct. 9, at the Country Club of the North in Beavercreek. Tickets to the induction ceremony are available for $35 each and can be purchased by calling the CSU Athletic Office at 937-376-6289. All those planning to attend must RSVP prior to the event and purchase their ticket(s) on or before Monday, August 31. INDIANAPOLIS — Student-athletes from Central State University will be participants in the Drive for Diversity Pit Crew Challenge on July 25 in Indianapolis, IN. The program is a comprehensive training program for aspiring minority male and female pit crew members. The program includes weekly hands-on, over-the-wall position training and coaching for tire changers, tire carriers, fuelers and jackmen, as well as weight training, agility and footwork programs. Being one of the only minority NASCAR team owners in racing, Max Siegel developed a mission to diversify both the participant and audience bases in NASCAR. Along with NASCAR’s Drive for Diversity Program, Siegel’s team has launched the NASCAR Drive For Diversity Pit Crew Development Program. The 2015 NASCAR Drive for Diversity Pit Crew Challenge Tour offers participants the opportunity to showcase their athleticism, speed and agility. Pit crew members in the National Series can earn extremely competitive wages, along with the excitement of being involved in one of the most recognized sports in the world. Each tour stop offers entertainment, access to a 2015 Gen 6 Race Car, participant giveaways, driver autographs, driving simulators, photo opportunities with celebrity judges and drivers, and much more. If you are an athlete and would like to be part of the Drive for Diversity Pit Crew Development Program, please visit – revracing.net/d4d/apply. Additional information can be found via – revracing.net/pitcrew. LAS VEGAS — Xenia native Matt Brown won his bout at UFC 189 against Tim Mean, but he didn’t make the pay-per-view card. The UFC 189 co-headliner between Robbie Lawler and Rory MacDonald hit close to home for Brown, because it wasn’t all that long ago that “The Immortal” took a seven-fight winning streak into a meeting with Lawler at UFC on Fox 12. A victory might have assured the Ohioan a title shot, but it was Lawler who emerged with an entertaining five-round verdict that night. A decision loss to Johny Hendricks in his next outing set Brown even further back. As a result, Brown was relegated to the preliminary bill at UFC 189 against Means, a dangerous opponent who flashed some of the same violent tendencies Brown often displays in the Octagon. This time, it was Brown who did the momentum halting, as he ended Means’ four-fight winning streak with a guillotine choke at the 4:44 mark of round one. One of Brown’s trademark elbows set up the finish, as he rocked “The Dirty Bird” and forced his wounded foe to shoot for an ill-advised takedown. While Brown concedes that Means got his licks in, he wasn’t about to be defeated at his own game. On a night when the UFC unveiled a new look, Brown was also going through a reinvention of his own. He got close to the top of the division once before, and now he’s that much more determined to finish that journey. RIVERSIDE — Coach Ben Rulli and the Carroll High School Football Team would like to invite the Carroll community to listen to legendary football coach Gerry Faust speak on FAITH, FAMILY, FRIENDS, and FOOTBALL. His talk will take place in the Carroll gym starting at 5 p.m. on Tuesday, July 28. Admission is free. Immediately following, in a separate event, Coach Faust will lead Dayton area parochial football players in a Rosary Rally to be held at the University of Dayton in front of Immaculate Conception Chapel. It is set to begin at 7 p.m.
Coach Faust was born in Dayton on May 21, 1935, and was an All-State quarterback for his father, Fuzzy, the coach at Chaminade High School. He earned three letters in football at the University of Dayton and was a teammate of former Carroll Coach Jim Spoerl. Over an18-season period, Faust led Cincinnati Moeller High School to a record of 174-17-2, 5 state championships, and 4 mythical national championships. He became the 24th head coach at The University of Notre Dame and compiled a record of 30-26-1 in five years. He resides in Akron with his wife, Marlene, and stays busy traveling and giving motivational talks inspired by his Catholic faith.